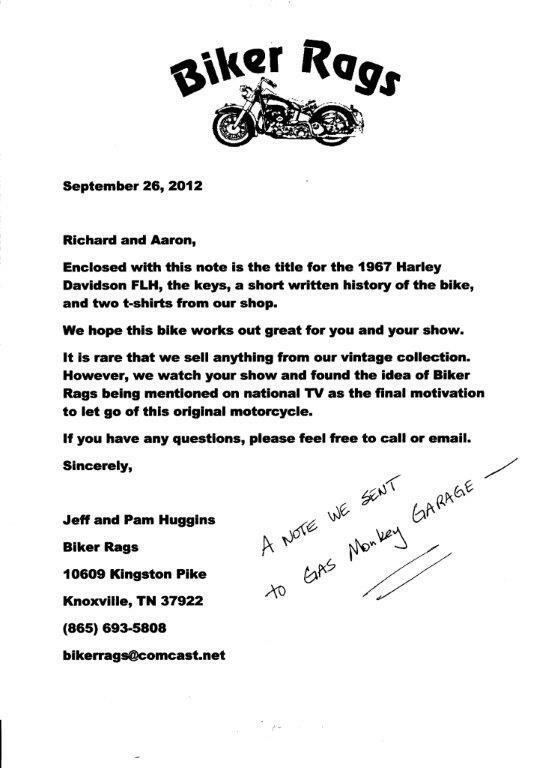 In September 2012, Aaron Kaufman of Gas Monkey Garage, contacted us about buying our 1967 Harley Davidson FLH. Here is the story of Fred as I originally wrote it in 2012. I’ve added a post script at the end. Hope you enjoy the story of Fred! Pamo’s drawing of the store. When I’m not laughing at some cartoon I’ve drawn or thinking of a humorous anecdote to share, I’m slaving away at the store with Jeff. We opened Biker Rags in 1994 and remain the owner operators to this day. 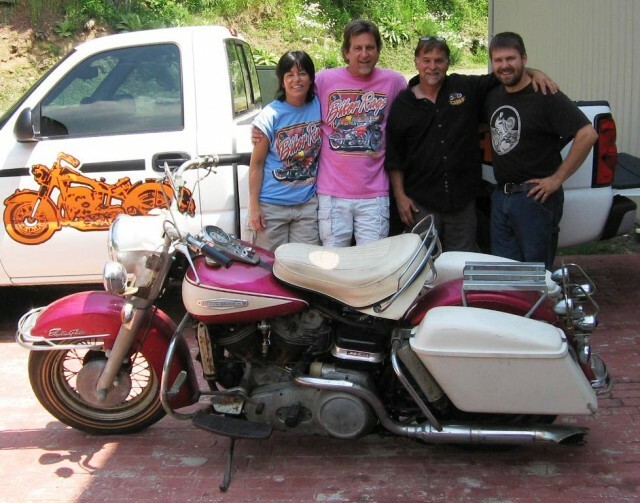 Our business is driven by our love of riding and our love of motorcycles. 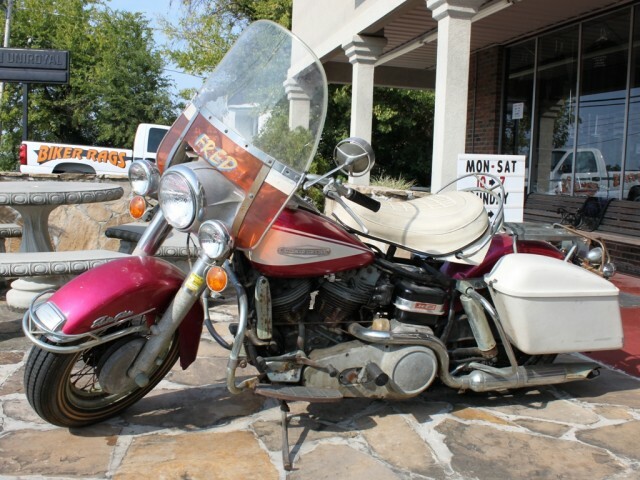 We’ve always had several bikes, but became serious collectors of antique and vintage motorcycles in 1996. 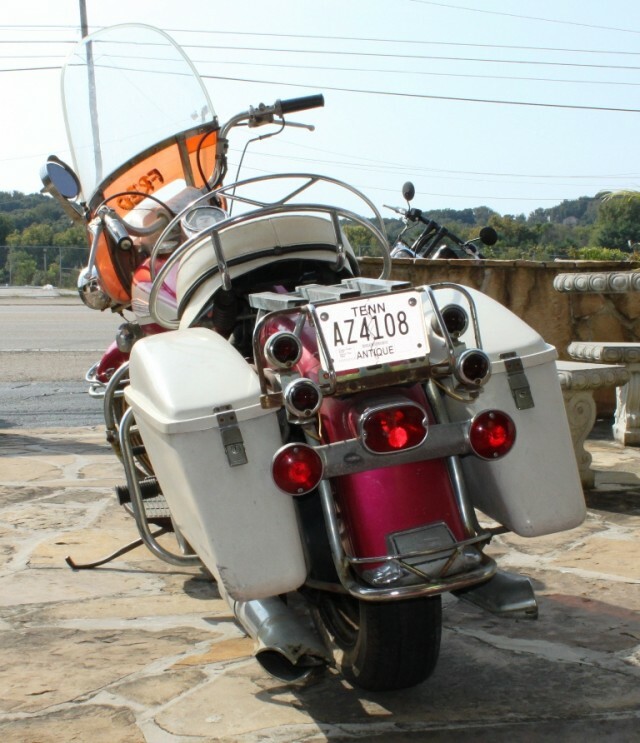 The collection has grown over the years and includes many rare and unusual bikes. We display around 25 of these bikes in our store at any one time and rotate the collection on a regular basis. Fred on display inside Wheels Through Time Motorcycle Museum – May, 2008. 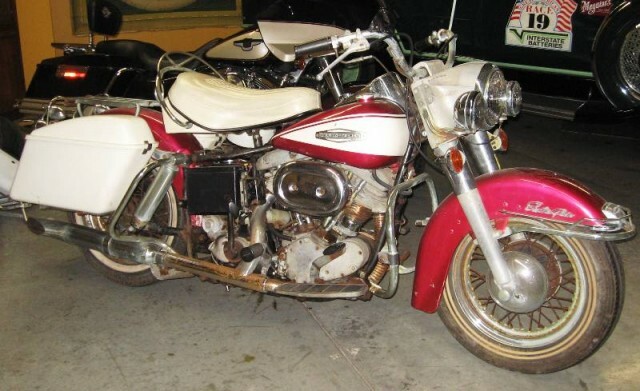 In June of 2008, while visiting the Wheels Through Time motorcycle museum, we spied a barn fresh, unmolested 1967 Harley Davidson FLH, also known as a ‘Pan-Shovel’ or a ‘generator Shovel’. 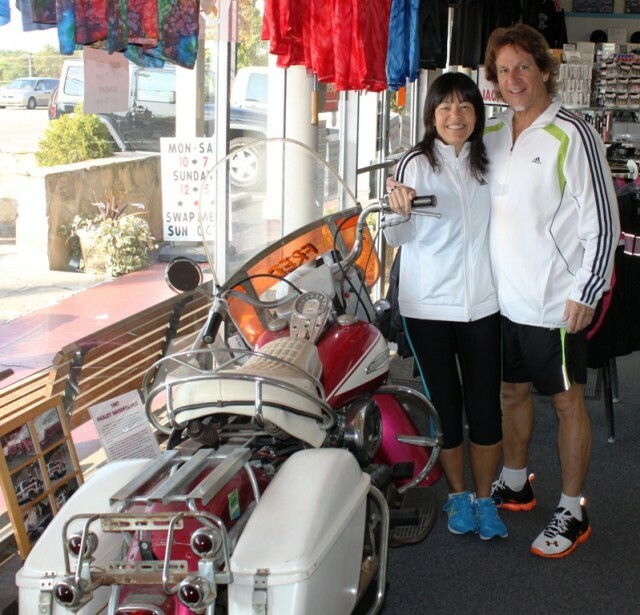 This was exactly the kind of bike we had been looking to add to our collection and as luck would have it, Dale Walksler, the WTT proprietor and collector extraordinaire, was ready to pass on this gem. He had been to our store, Biker Rags, and knew we would give it a good home. Picking up “Fred” at Wheels Through Time. Taking him to his new home at Biker Rags. June, 2008. Pictured left to right: Pamo, Jeff, Dale Walksler and his son Matt. After a couple of weeks of negotiations, we finally made a deal, loaded up the ’67 FLH on our Biker Rags truck and placed him in our collection. Jeff had acquired an old windshield years before to use in one of our vintage displays. It matched the old FLH and the bike became lovingly known as “Fred”. 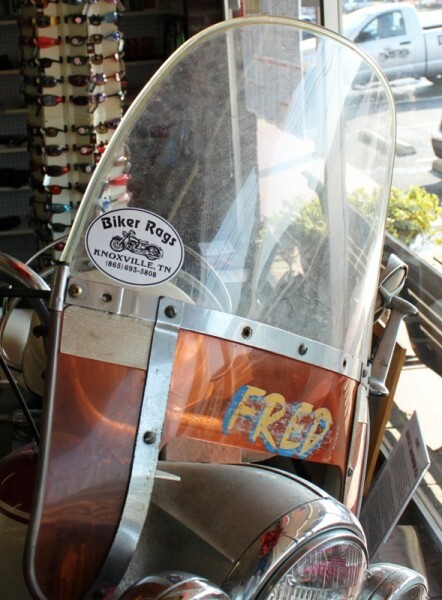 Fred on display in the front window of Biker Rags. September, 2012. This past September 24th, we got an email from Aaron Kaufman, head mechanic from Gas Monkey Garage in Dallas, Texas, starring in the new Discovery TV show Fast N’ Loud. Gas Monkey, part of the latest TV Biker Build Off, wanted a very specific bike- an unrestored FLH generator Shovelhead. In their search, they called Dale Walksler who, in turn, told them that Biker Rags had just the bike they were looking for. Gas Monkey wanted to know if we would be willing to sell them Fred and be on TV. We don’t normally sell bikes out of our collection, but we figured the chance to promote Biker Rags on national TV was probably a once in a lifetime opportunity. So we agreed. Fred displayed on Biker Rags front patio. September, 2012. Several phone calls later, they told us that production had already begun and they needed the bike as soon as possible. At first they were going to come pick up the bike and film it but that quickly changed to having it shipped to them by truck. Once they arranged for the shipper, we realized Biker Rags wasn’t going to be on TV. Since we had already agreed to sell them the bike, we chalked it up to being naive and figured that at least we would get a mention on the show. Fred being loaded up. Heading to Gas Monkey Garage in Dallas. September 2012. Another couple of phone calls later, the reality part of Reality TV hit us pretty hard. To make the show more interesting, Richard Rawlings, owner of Gas Monkey Garage, had decided to say they bought the bike from a local bike collector in Dallas so they could film the transaction. Needless to say, we felt as deflated as a fifty year old tire. So we did what any red blooded American does when cheesed, we blabbed it to everyone we knew. 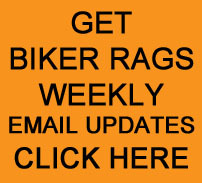 We sent off an email to all our customers on the Biker Rags email list telling the story. The response from our customers was overwhelming! Some were shouting to get the bike back, others were talking about a Fast N’ Loud boycott, and the emails were being forwarded faster than a Harley in spring! That very evening, we got a call from Richard, who had the forwarded email in hand. He did a bit of back tracking, saying we had misunderstood his intentions and that Biker Rags would be mentioned and credited as the original source of ‘Fred’. We thought ‘that’s nice but we won’t hold our breath’ knowing that the pressures of reality TV must be overwhelming. The Biker Build Off 2012 airs on Monday, December 10th and Tuesday December 11th, kicked off by Fast N’ Loud at 8pm. We know from following the Gas Monkey Facebook page, that while the bike has been completely changed and customized, they still call him “Fred”. In watching the shows, Orange County Choppers, Outlaw Garage, and Fast N’ Loud, we’ve seen the FLH engine dismantled on the Gas Monkey lift and we’ve seen Fred’s old windshield in the background. This past Monday on Fast N’ Loud, Richard said he can’t wait to see Jesse’s face when he beats him in the Build Off with a pink motorcycle. Jeff and I are pretty excited about the whole thing. On Monday December 10th (2012) starting with the new episode of Fast N’ Loud at 8 pm, on the Discovery Channel, we get to see Fred in his new life form and we’ll have a great story to share. So if you watch the show, root for Fred! He was a big part of our family at Biker Rags and was enjoyed by many. Bye Fred! We’ll miss you. Good luck in your new endeavor. September, 2012. POST SCRIPT: Despite the verbal promises made to us, Biker Rags was never mentioned on Fast ‘N Loud or Biker Build Off. Aaron and Richard won second place in the Build Off with their updated Fred. Shortly thereafter, the bike was won by a Fast ‘N Loud viewer in a drawing. Letter we sent with Fred to Gas Monkey Garage. This entry was posted in Bike Show, Biker Build Off, Biker Rags Story, Fred, Vintage Bike and tagged Biker Build Off, Biker Rags, Fred, Gas Monkey Garage. Bookmark the permalink.